This article will explain Message Queue partitioning in PeopleTools Integration Broker. Partitioning is defined at the Queue level and it tells the integration broker if messages in a queue can be processed in parallel or not. This is queue dependent and setting up proper queues and partitioning can be critical in setting up effective loosely coupled systems. If you configure it incorrectly, one error in the queue can block everything which can be disastrous for high volume message queues. There are times that you want to configure partitioning and other times when you do not. This is really dependent on the nature of the message and how the receiving system handles the data. Partitioning is best explained with an example. Lets take the case of the USER_PROFILE_SYNC service operation. This Service Operation is used to sync PeopleTools user profiles between different PeopleTools databases or other systems. This service operation is defined in the USER_PROFILE queue. When you look at the queue setup for the USER_PROFILE queue you can see that all the common fields are listed on the right hand side. 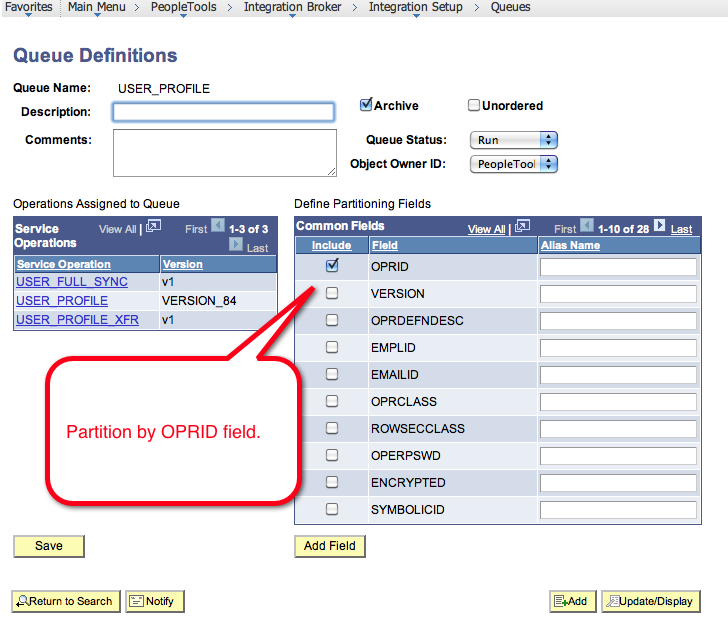 In this screenshot the OPRID is checked for partitioning. Lets say that 3 users all change their password in your HR database and the USER_PROFILE_SYNC service operation fires to synchronize that user change with your Finance Database. Let’s assume that user JOHND, SALLIES, and ROBERTD all changed their password in that order but within seconds of each other. The user JOHND hit save first so the USER_PROFILE_SYNC message for his user profile was queued up for publication to your finance database. Let’s say that that the JOHND user id did not have permission to publish user profile messages to finance due to a security setup on his profile. 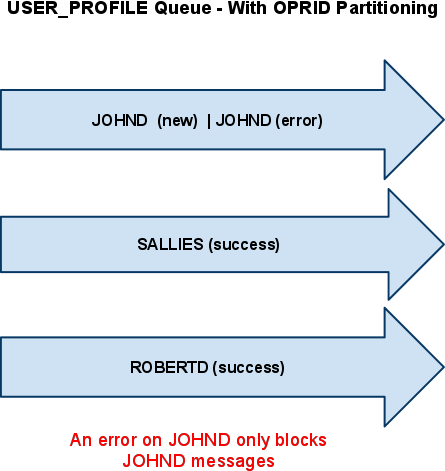 Since we have partitioning setup on the OPRID common field level, the publication error on the JOHND user profile will NOT block the publication messages of SALLIES and ROBERTD. The SALLIES and ROBERTD message both went to success. This is shown in the drawing where each user basically has their own “lane” in the queue and the “lane” is setup based on the partitioned field.